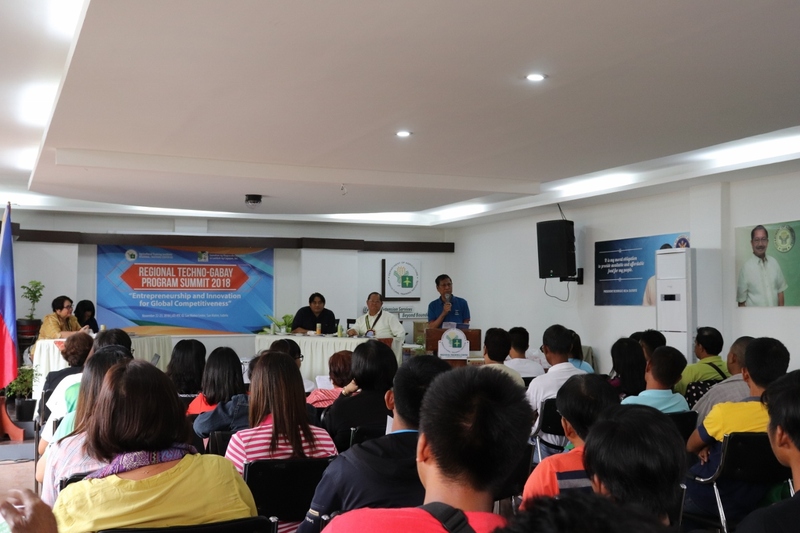 The Agricultural Training Institute-Regional Training Center 02 together with the Samahan ng mga Magsasaka Siyentista sa Lambak ng Cagayan, Inc. (SMSLCI) once again conducted the annual Techno-Gabay Summit held on November 22-23, 2018 at ATI-RTC 02 San Mateo, Isabela. With the theme, “Entrepreneurship and Innovation for Global Competitiveness,” the two-day event was attended by about 150 stakeholders from the FITS Centers, state universities and colleges, and rural-based organizations. The Summit served as a learning and knowledge sharing platform and an opportunity for the Magsasaka Siyentista to create linkages and promote their products and technologies. The Department of Trade and Industry had presented their module on enterprise development. Ms. Jessamae Malana of DTI-Isabela gave an overview of the characteristics of a successful entrepreneur and the factors leading to a successful enterprise. She also shared the different programs, projects and opportunities being offered by the DTI to budding entrepreneurs. Meanwhile, Engr. Sylvia Lacambra and Mr. Lucio G. Calimag, the provincial directors of DOST-PSTC Cagayan and Isabela, respectively, presented the programs and projects of the Department of Science and Technology. They thoroughly explained the process of availing their programs such as the Small Enterprise Technology Upgrading Program (SET-UP), technology consultancy services, Consultancy for Agricultural Productivity Enhancement (CAPE), Cleaner Production Technology (CPT), packaging and labeling, energy audit, and Regional Standards and Testing Laboratory (RSTL) for Chemical, Microbiological and Metrology among others. MS Ignacio Pascua of Tuao Cagayan, the 2018 Outstanding Organic Agriculture Farming Family of Region 02, also shared his innovative and best farming practices. He presented their various farm enterprises such as vermicomposting, rice production and processing, and vegetable production. In addition, 2017 Best Magsasaka Siyentista, Engr. Ramon J. Oliveros of Roxas Isabela, shared his experiences and farming innovations that helped him to be a successful agripreneur. Mr. Dante Castillo of the FITS Center Claveria, Cagayan, meanwhile, gave an overview of their operations and extension activities which contributed for hailing them as 2017 Best FITS Center in the region. Another highlight of the summit is the awarding ceremony for the winners of 2018 Search for Best MS and FITS Centers. For the Best MS, the first place was MS Jomar Jarvinia of Cabatuan, Isabela, followed by MS Manuel Pasion of Delfin Albano, Isabela, and the third was MS Jose P. Villamil of San Guillermo, Isabela. For the Best FITS Centers, the first place was Cabatuan, Isabela; second place is San Guillermo, Isabela, and the third is Tuguegarao City, Cagayan. A Plaque of Recognition and project funding were given to the winners. On the other hand, the products of the Magsasaka Siyentista and the One Town - One Product of the participating local government units were showcased. Wide arrays of products from seedlings to processed foods were displayed and sold at the booths of the provinces of Cagayan, Isabela, Nueva Vizcaya, and Quirino. The SMSLCI also facilitated a raffle draw of different farm implements with a total prize worth P100,000.00.